The evidence of a chemical and biological assault upon the sanctity of this planet is at hand. For close to two decades, Carnicom Institute has patiently accrued and presented this record of violation to the global public. The circumstances, situations and reports that justify such serious claims are far beyond the point of “concern”, the need for “investigation”, or the entertainment of “conjecture”. One of the primary materials repeatedly deployed in the operations is that of a unique “environmental filament”, as it has been designated over the decades on this site. 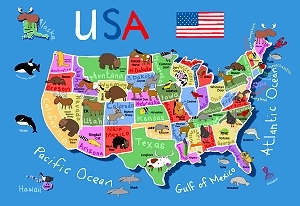 The material has a long history of study, beginning with the failure of the U.S. Environmental Protection Agency (EPA) to identify an early sample sent to that agency in the year 2000. The prospect of a public health risk was included in that correspondence and this was the primary basis of the request for identification. The filaments have an airborne source. Unusual biological components were identified in that and similar samples at the time, and they were documented as such. The record of all correspondence with the EPA exists on this site. 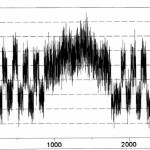 An additional act of record from the year 1999 exists within the paper entitled “Environmental Filament: False Report”, (Jan 2013). This paper further documents the thwarting of efforts (paid for) to disclose the nature of this material to the general public. If you are a novice to the subject, or if you are easily swayed by the words and reports of popular persuasion, you will be told that you are dealing with nothing more than some mildly unusual events that involve flying, or “ballooning spiders”. You will not be given any on-ground scientific study that documents this strategy of shaping perception, but you will be told that it is so. Network media reports will promulgate the story line, with an inclusion of the purported arachnid family (e.g., Linyphiidae) to boot. If this approach is adequate for your needs then it may be best to simply move on to the next story or commercial of the day. The samples examined by this researcher are NOT spider webs. All direct examinations demonstrate that they are of an unusual or artificial origin and of a complex chemical and biological nature. No spiders accompany the samples that have been received. Ironically enough, the filaments do indeed share some physical and chemical characteristics with actual spider webs, but this mimicry will hold only at a superficial level. Mainstream science reports recently announce to us that the creation of completely artificial spider webs is now commercially in place; realistically, we should not ignore the covert world of material science development along that path to public disclosure. 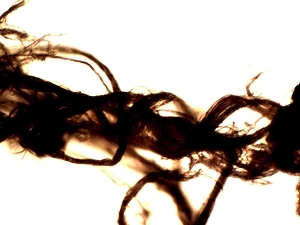 The internal composition of the filaments differs dramatically from spider webs, and it is here that the truth will be found. Nanotechnology is usually inaccessible to the general public, but the boundaries and frontiers of it are -with some creative hacking. As an understanding of the filament internal structure develops, examinations at the nanometer level will certainly be required to understand the intentions and design more clearly. In the meantime, fortunately, sufficient laboratory means to make the necessary distinctions between various forms and molecular structures exist. 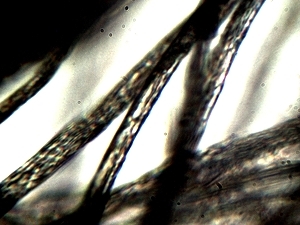 Environmental Filament Sample, Magnification approx. 20x. Representative countries that have collected and sent samples of the environmental filament material to Carnicom Institute over the past two decades. It has taken some effort over time to coordinate the receipt of these samples across the globe. 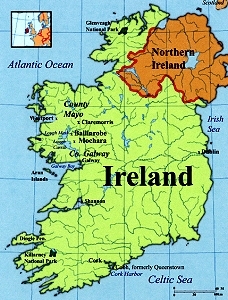 This library of samples and the accompanying examinations have recently crossed an important threshold; a physical sample has been delivered from Ireland that accompanies the onsite video immediately below. This combination creates an irrefutable presentation of video and physical evidence that demands a verdict. Under the current climate, no one can speak of spider webs alone without proving their case. What distinguishes this particular case in Ireland is that a physical filament sample has been sent in combination with the video evidence; these provide a more accurate assessment of the situation on the ground. The filament material received in this case, in all respects known, is identical to that sent to the U.S. EPA close to 20 years ago. 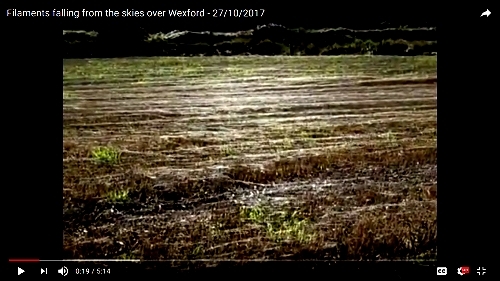 The material received from Ireland is NOT spider web material, and the observations on the ground reinforce that claim. The ruse of proclaiming (along with puppet reporting) that spider webs are distributing themselves frequently and across the globe en masse has now played itself out. Ballooning spiders on a larger scale are a real but rare phenomenon; the extensively examined environmental airborne filaments unfortunately are also quite real, but they do not originate from spiders. Seasoned readers may recall the first publicized sample in 1999 from California that formed a ribbon of material approximately one half inch thick and spanned a length of about 20 feet on the highway. That would be a problematic spider. The environmental filaments can no longer be considered rare at this point. The materials repeatedly dispersed to ground level are a public health hazard as originally proposed to the U.S. EPA approximately two decades ago. They are of a complex chemical and biological nature. These materials are known to be affecting the entire planet and all life that exists upon it. In this particular case, the environmental sample is quite clean. 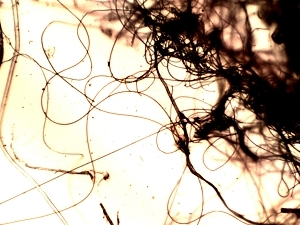 The spider web material to the right does have some debris captured within as expected; this occasional contamination is readily visually separated from the web filaments under the microscope. The spider web sample is composed of approximately one half dozen webs combined. Next, the materials are examined under the microscope at various magnification levels. 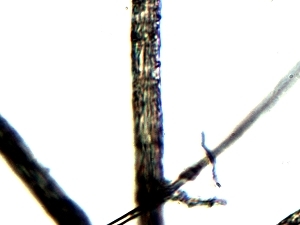 The first series is taken at approximately 500x magnification. 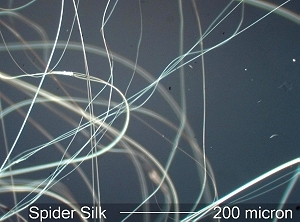 The differences in appearance are not notable at this stage, however, it can be determined with careful observation that the spider web filaments have a more linear quality to them than the environmental filaments do. This lower magnification level is not sufficient to readily identify the different structural nature between the two sample types. 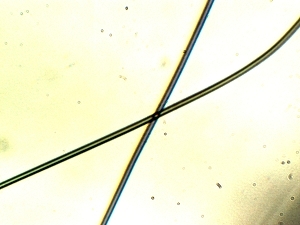 Spider Web Sample – A smoother and more linear structure is observable within the spider webs versus the environmental filament. The differences are not dramatic at this lower level of magnification. Magnification approx. 500x. 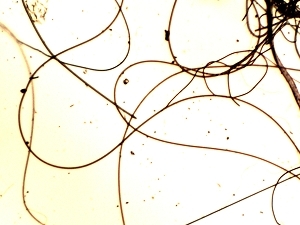 Environmental Filament examined under microscope at moderate magnification. It is here that important differences can be determined between the visual characteristics and structural nature of the two filament types. 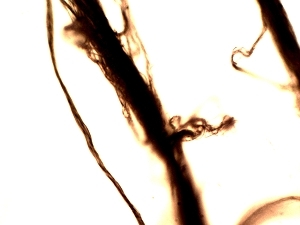 The environmental filaments show much higher variability in form and structure than the spider webs do. The environmental filaments do indeed have a much wavier appearance to them; this has direct bearing on the extreme adhesive and stretch qualities of the filaments as has been repeatedly observed over the years. 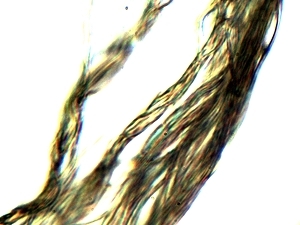 In addition, the filaments demonstrate budding growth forms that demonstrate a clear biological nature to the filaments as opposed to inert spider web generation. It is at this level of magnification that the case of fundamental difference and distinction exists between the environmental filament and spider webs. It is insufficient and unjustified to make the claim for either type of filament existence without this minimum level of observation and analysis; this requirement exists for any journalistic or scientific reporting as well. Magnification approx. 1250x. 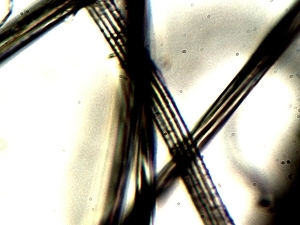 Spider webs at moderate magnification. The spider webs continue to show that they are simpler and more uniform in structure. There are no dramatic changes in the basic structure of the spider web that emerge at this level of observation. The geometry of the spider web is more linear, and of smoother geometry and texture. There are no ‘budding’ growth forms that take place in spider webs after their formation. Magnification approx. 1250x. 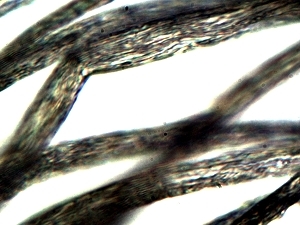 Microphotographs of the “environmental filament” at high magnification. The truly unique qualities of this material are shown much more clearly at this level of observation. It can be understood from these photographs that the driving structure and morphology of each filament lies INTERIOR to the filament. 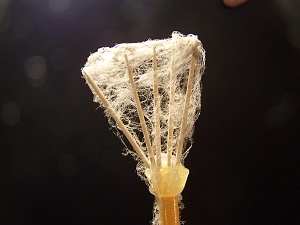 The bundled filament structure (sub-micron) interior to an encasing filament is a distinctive feature of many samples. The boundaries of nanotechnology are opened to further investigation at this point. Budding growth structure can again be observed within this set. 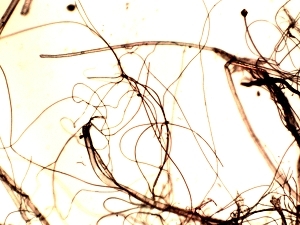 It is only at this level that the tentatively designated “cross-domain” bacteria is first observed; this microorganism has become the subject of intensive study in association with the Morgellons health condition. 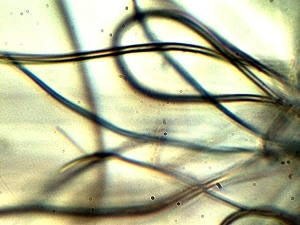 A level of equivalency by numerous methods has been established between the environmental filaments and biological filament growths directly associated with the Morgellons health condition. Magnification approx. 5000x. Spider webs at high magnification. 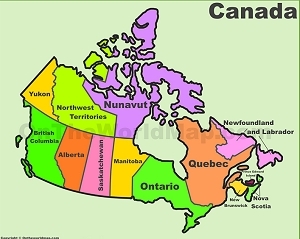 The additional information available that can be acquired here is relatively uneventful. The geometry of the spider webs is again smoother and more linear in fashion. 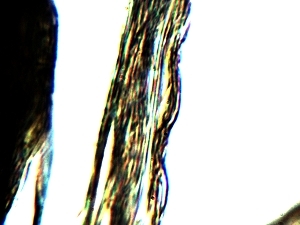 There is no variable and complicated inner micro structure visible at this stage within the spider webs. There is no budding or extension growth from the spider web. Magnification approx. 5000x. 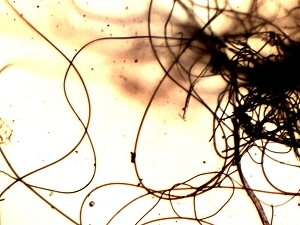 The case that the “environmental filaments” are NOT “spider webs” is unequivocal and indisputable at this point of analysis. It is sufficient to end this report at this time. I will, however, add some additional comments at a later point. 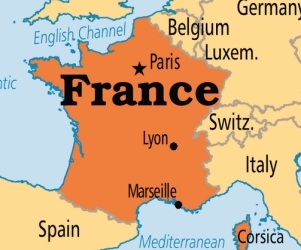 The conclusions reached have been made many times over in the past. The imagery here hopefully makes the point more clearly to those that remain in need. In early years of work, these same conclusions were reached largely by qualitative chemical testing along with modest microscopy resources available at the time. Those conclusions were at the heart of the motive for seeking assistance from the U.S. Environmental Protection Agency close to two decades ago. This publicly funded agency failed in meeting its mission obligations at that time, and it remains in negligence today. The failure of that agency in its primary mission to protect the health and welfare of the general public bears some level of responsibility for the current state of ecology of the planet. The worldwide occurrence and distribution of the problem shows us that the responsibility is now shared at a global level and by all countries and citizens of the world. It remains our decision as a species and as stewards of the planet how we now choose to proceed. Nature is not under the control of human beings, as we can only assume a limited role on a much larger stage. We do, however, remain responsible for our actions to our existing generation, and to those that follow if we choose to care. There are many different methods to establish the uniqueness of materials. In this case, microscopy alone is more than sufficient. Subjecting a material to different portions of the electromagnetic spectrum is another mainstay in the pursuit of material identification and structure. This is the basis of spectroscopic methods. In this case, the two filament materials are subjected to ultraviolet radiation. A difference between the spectra further demonstrates that there are internal molecular differences and structures between the filaments. The additional methods that are described will not be discussed at length, but they will serve the purpose of introducing the numerous methods by which the environmental filament and spider webs can easily be shown to differ from one another. 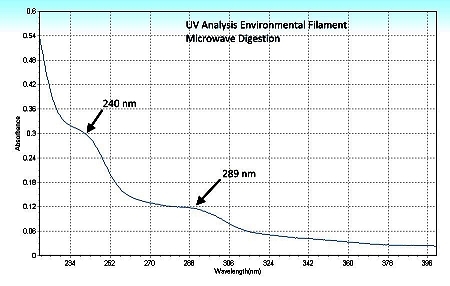 Differing absorbance maximums between the two materials are evident. The next method of comparison is that of NIR, or Near Infrared spectroscopy. The spectra range between 700 and 1100 namometers. The different absorption maximums between the two sample are again evident. NIR does have some value and utility in the identification of organic functional groups within a sample. 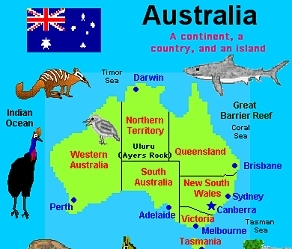 In this case, reference is made to an existing paper published on this site. In August of 2017, a paper was published on this site entitled, “Environmental Filament Project: Metals Testing Laboratory Result”. The paper presents the results of a commercial laboratory test for metals within the environmental filament sample material. This particular method of testing is quite sophisticated and expensive, and it uses highly specialized laboratory methods and instruments. It has taken some effort to make these results available to the public. 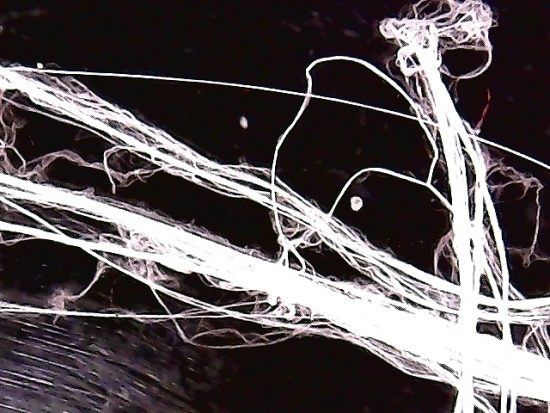 In this case the methods have been applied solely to the environmental filament; there is no counterpart analysis of spider web material available since that question was not a motive for the original test. What is significant here is that the environmental filament material is known to contain a complex distribution of metallic elements . This fact must now be coupled with the existence of an equally complex biological profile within it. This can be summarized by stating that environmental filament is known to have, therefore, a complex organometallic nature to it. It is quite certain that this knowledge adds to the uniqueness as well as uncertainties of impact from the material. It is quite reasonable to state that these uncertainties impose a level of unknown risk to its exposure. 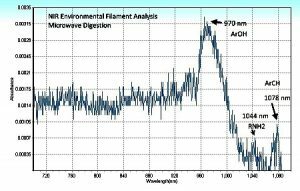 Infrared spectrometry provides especially interesting and intriguing insights into the nature of the environmental filament material. The primary interest here involves the exterior casing of the environmental filament; not the complex structures that exist within it. It has long been advocated that the filament form appears to be acting primarily as an encasing and delivery system, and that the composition of the exterior boundary is actually of secondary importance. This remains the case. The analysis by infrared spectrometry only further confirms this position. 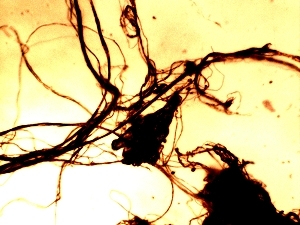 Infrared spectrometry reveals that there is actually a great deal of similarity to be shared between human hairs, spider webs, and the environmental filament casing. 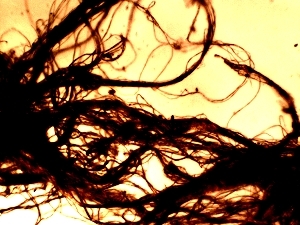 The argument for keratin or keratin based compounds is endemic to all three, especially in light of detailed infrared comparisons and analysis, as well as in the literature for the former two. This fact can easily obscure and deflect the target of importance for the environmental filament, and that is its INTERIOR structure, – chemical and biological. Citizens are advised to force the issue on this situation by demanding and requiring a broad and detailed examination of the material using a variety of technologies. 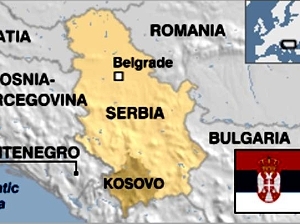 Locally, close to a half dozen techniques have been employed in the background of this report. It is true that sufficient microscope examination will provide distinction of identification, and in many cases this will be sufficient for the cause. The true and full nature of the environmental filament will, however, only be properly revealed with the use of a multitude of advanced technologies. 1] Cyclic and differential cyclic voltammetry. 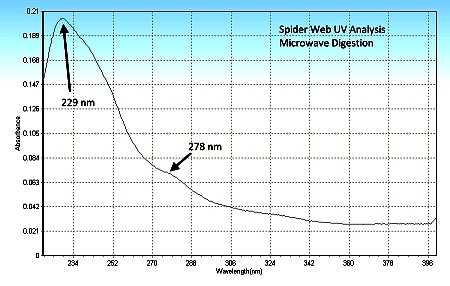 The electrochemical properties of the environmental filament and the spider web are quite distinct from one another. 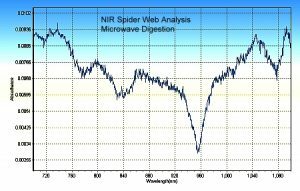 The general interpretation from this plot is that the spider web is anticipated to be more electrochemically active than the spider web is; this interpretation coincides with the extensive metals that are present in the ICP-MS test results discussed above. 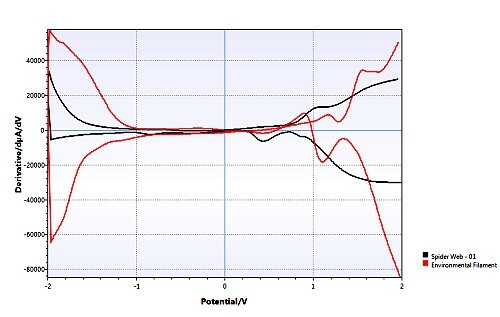 2] AC voltammetry and cyclic AC voltammetry. 3] Normal pulse voltammetry and cyclic normal pulse voltammetry. 4]Electrical impedance spectroscopy, including Randle’s circuit modeling methods. The results from the five additional methods more than confirm the conclusions of this report. Anticipated magnitude, frequency and scale of the events. The appearance of masses of spiders in conjunction with the events in congruence with the volume and coverage of webbing observed. Dissolution of the web material, natural or synthetic, under environmental exposure must be examined in greater detail. What is the behavior of the ballooning spider at the time of web formation? Where is the ballooning spider located at the time the web was formed(e.g., elevation above ground) ? What mass of material is expected to be produced in most cases? What is the expected range and dispersal pattern of this mass? In the absence of visible spider presence, there is now a requirement for laboratory analyses in conjunction with any claims of presumed spider origin. This demand is further supported by the current public disclosure of artificial web capabilities. These questions are of interest to gain knowledge on, and I would encourage all readers to do so. The existence of natural webs does not preclude the existence of synthetic webs, or vice versa. The existence of either form does not provide a basis for dismissal of the other. Each situation must be addressed individually, comprehensively, and accurately; disingenuous or inadequate coverage does not obviate the need for honest investigation and disclosure. Many thanks to Terry Lawton in Ireland for providing information for the benefit of the public on this subject. Born Clifford Bruce Stewart, Jan 19, 1953.